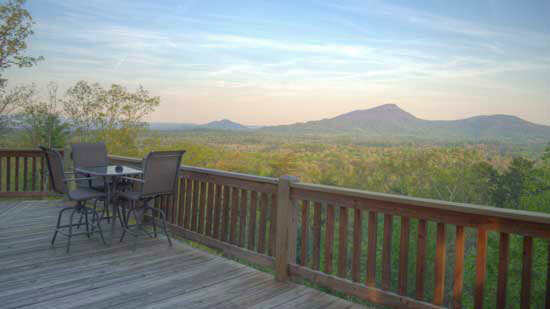 Looking for a relaxing mountain getaway with that special someone? 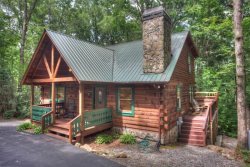 Look no further than this incredible pet-friendly couples cabin! Nestled in the woods of Sautee-Nacoochee, the tranquil surroundings and first-rate amenities, along with a wonderfully romantic atmosphere, create the perfect backdrop for an unforgettable mountain experience! Get back in touch with nature together in this lovely mountain cabin named after the twin waterfalls at Anna Ruby! Twin falls is just 2.5 from Unicoi State Park, and 6 miles to the Bavarian village of Alpine Helen. You'll see beautiful canvases of the twin waterfalls Anna Ruby is known for, mounted in the living room and kitchen/dining area! Surround yourself in quiet tranquility, and enjoy Twin Fall's wonderful outdoor amenities such as the inviting 4-person hot tub with stack stone backdrop and seasonal waterfall, large screened-in back porch with rocking chairs, perfect for morning coffee, reading a good book or just taking in the beautiful wooded views. Get comfy on the living room's new leather sofa positioned perfectly for taking in your favorite shows on the flat screen TV, or warming up by the wood-burning stone fireplace. Two beautiful (locally crafted) Hickory rocking chairs complete the living room area. You can also enjoy an invigorating game of pool while watching your favorite team compete, or just use the WiFi to check out our many happenings around the village, or where to dine at one of our outstanding local restaurants. The open floor plan with dining/kitchen combination provide all the tools needed to prepare a great meal. The kitchen is fully equipped with stainless steel appliances, as well as extras like a dishwasher. The dining table is a rustic combination of wood, stone and metal is both beautiful, with plenty of room for your gourmet meal! Perfect for couples, this home's sole bedroom and bath will let you and that special someone enjoy your stay in comfort. The bedroom boasts a luxurious new king-size BedBoss bed (similar to TempurPedic) alongside a rock facade soaking tub. Relax in the tub or hang out in bed and binge watch your favorite shows on Netflix, Amazon, etc. on the flat screen SmartTV. The bathroom is bright and clean, and includes a spacious shower with dual side shower heads and a large waterfall shower above - perfect for getting refreshed before exploring gorgeous Georgia! Natural beauty, great amenities, and a romantic vibe await you at Twin Falls. Don't hesitate - make your reservation today!